Marijuana On The Ballot: Oregon And D.C. Vote To Legalize; Florida Says No : The Two-Way Florida's medical marijuana ballot measure fell short of the 60 percent approval required. Oregon voters approved Measure 91, allowing legalization. Alaska also has a legalization ballot measure. 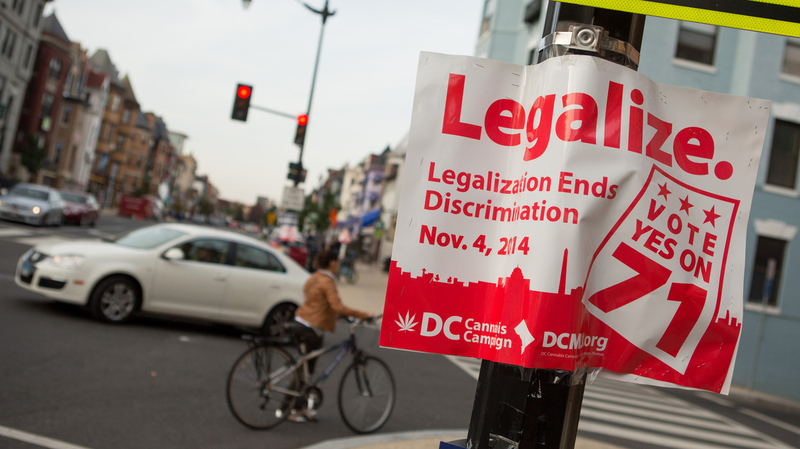 Early results showed more than a 2-1 lead for a measure to make recreational marijuana use legal in Washington, D.C. A sign promoting the initiative is seen on a corner in the Adams Morgan neighborhood Tuesday. The D.C. case could create friction between the city's leaders and Congress — particularly if, as many expect, Republicans take control of both chambers. The District's Initiative 71 includes provisions that allow residents to grow six or fewer marijuana plants in their homes and possess up to 2 ounces of the drug for their own use. Voters in Guam reportedly legalized medical marijuana use today, and other states, including Alaska, are also taking up the issue. We'll update this post as more results come in. You can also follow our special coverage at NPR's Election Party. With 97 percent of precincts reporting, Alaskans have voted to legalize marijuana by a 52 percent to 48 percent margin. "The initiative will not become law until 90 days after the election is certified, which is expected to be in late November. Per the law, the state can then create a marijuana control board — expected to be housed under the Department of Commerce, Community and Economic Development. That group will then have nine months to craft regulations dealing with how marijuana businesses will operate. "The initiative was years in the making. Alaska voters considered similar measures in 2000 and 2004. Both failed, though each indicated a measure of support for legalization. Measure 5 in 2000 took 40.9 percent of the vote; Ballot Measure 2 in 2004 gained a few more points, with 44 percent of the electorate voting in favor of it." With nearly 65 percent of the vote tallied, Oregon is projected to have approved Measure 91 legalizing recreational use of pot, with nearly 54 percent in favor and 46 percent against. The Oregon bill gives regulatory control of pot to the state's liquor control agency. It would also allow Oregon citizens to grow up to four plants at a time. The state's legislative revenue office recently estimated that "in fiscal year 2017, the revenue from legal marijuana is expected to be $16.0 million with a lower range of $13.1 million and an upper range of $19.4 million." "Marijuana legalization has been a long-standing issue in Oregon," Oregon Public Broadcasting reports. "In 1986, a failed measure first sought to legalize recreational pot. It was rejected by a large majority of voters." A ballot measure in Florida that would permit the use of medical marijuana has failed to reach the 60 percent mark required for constitutional amendments in the state. Current projections show 58 percent in approval, with 42 percent against.